Ordinary Days: Forty and freaking out! I guess if I stop and think about it, though, I have many things to be thankful for, even at 40. I am so grateful for my family. Christian parents who sacrificed to send me to a Christian school and provided me with so many experiences like mission trips and summer camp and vacations to interesting places. Brothers and sisters who annoyed me but loved me and helped me grow in so many ways. I can't imagine my life without my husband. Just today, when he was preaching his sermon and he brought us to tears and made us laugh and taught us something new about prayer, I felt a sense of wonder that God gave me this wonderful gift. He has been the one to hold me up when I literally could not stand on my own. He has listened to all my dreams and shared all my tears. He is the only person who knows my heart completely. Anyone who knows Allie knows how blessed I am to be her mother. I look at her sometimes and I know that there is a God because only He could take my feeble attempts at motherhood and create such a beautiful example of a Godly young woman. She amazes me with her love for God and her desire to serve Him with her life. She is so full of life and sometimes I have a hard time keeping up with all of the changes I see in her. I can only sit back and watch as she moves forward in her journey and I will tag along as long as she allows me. There is absolutely no way to talk about my blessings without mentioning my butterfly, Emma. She has changed me and I will never be the same because of the nine years she was mine. She is with me still. She is with me when I rub Allie's back and push her hair behind her ear and kiss her neck. She is with me when I tickle Anna's tummy and beep her nose and let her run her fingers in my hair. 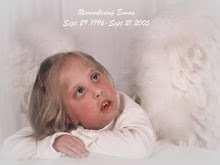 Emma loved those things and she lives on in my heart when I repeat them with her sisters. If I could have one birthday wish it would be just one more day with my Emma. One more chance to do those things with her. To hear her laugh. To see her smile. One more time. And now I have this blessing of Anna Grace. She is a gift of grace to our family. A sign of new life. An example of God's redemption in our lives. I can't wait for everyone to meet her. To see her smile and experience her sweet, sweet spirit. When I think of all of the loss she has gone through in her short life, I am filled with sadness for her. But then I think of the amazing grace of God to place her in our family. A family that knows loss. I will never minimize her loss but I hope I can teach her that it doesn't define her. It can refine her, but not define her. One thing I have learned since Emma's death is that life does go on, but so does grief. It isn't something you get over or past. It follows you, sits with you, sleeps with you, makes its home in your heart. Grief is a faithful and constant companion. It doesn't leave you the same. I have learned the choice is not whether to grieve or not, it is how you let it change you. It will change you. I pray it changes me for the better. I know that how I parent Anna will be different because of that grief. Even though she never knew Emma on this earth, she will feel her presence and she will feel her loss. To deny that would be a lie. Our job will be to teach her the lessons we learned from loving and losing her sister. All of that reminded of another of my blessings at 40. I have such wonderful friends. Friends who embrace me along with my imperfections. Friends who see me in my grief and love me anyway. Friends who were faithful and stood by me when I battled the sadness that engulfed me. Friends who don't minimize my grief or wish it away but welcome it into their lives and allow it to change them also. Friends who truly share my joy as if it were their own. Happy 40th Birthday! Love Ya! Happy Birthday, 40 is just a number! It was cute this weekend my brother had a bday, and as we were eating cake Deven asked my mom how old she was. Her response was "28 and holding" which has been her response for as long as I can remember. It gave us all a good laugh because my brother turned 28. So my mom now has 3 of her 4 children older than she is willing to be herself!!! It's interesting how a certain birthday can be scarey or unwelcomed, and it's a different one for everyone. You are an amazing person no matter what the number is for this birthday. You may not be were you envisioned at this point in your life, but God has a greater vision for you and I have no doubt that you are on His path in His time! What a special place to be! Happy Birthday Stacey! Hope you have a wonderful day. Stacey, you are catching up to me only 7 more years to go. Happy Birthday! We have enjoying getting to see pictures of Anna Grace. She is beautiful and can't wait to see her in person. The pictures on here of Allie show me how fast she is growing up and what a beautiful young woman she is. We miss you all and send our love. Thanks for you encouraging words...God has given me such a peace today. Happy Birthday!! I loved this post! Happy Belated Birthday! I just thought I'd check your blog to see how Anna is doing and was surprised to see that we share the same birthday. I, too, was born on July 28th...but 2 years after you. Hope the 40th thing isn't too bad...it will come soon for me! Anna looks great, and seems to have found her place. Dylan is doing well. I haven't posted on the blog in awhile. I'll probably do an update soon. Send me an email so I can correspond with you directly and send photos. My email is hsbergmann@msn.com.